It is a truth universally acknowledged, that a single person in need of some comfort must be in want of a bowl of chicken soup....Or words to that effect. As Jasmine rightly says, chicken soup is widely acknowledged as the remedy for pretty much everything. Chicken soup truly is a salve for the soul. When the weather turns chilly, when you're feeling low, when you need a comforting hug, whatever the weather, chicken soup never disappoints. Growing up, at the first hint of a sniffle my mama would whip up a batch of chicken soup with a hit of extra chilli in there to, you know, clear out the sinuses. Far more delicious than a mug of lemsip. Jasmine's mother is from the Philippines, and by all accounts she makes a mean chicken soup. I love that chicken soup is something that people the world over love, and we all bend and adapt it in our own way. It's a universal dish and one that shows a lot of love and care for the recipient I always think. The Filipino version of chicken soup is called Tinola and is essentially a chicken soup fired up with lashings of ginger, which sounds absolutely delicious. Chicken and ginger is a beautiful combination and the deep fiery, earthiness of the ginger brings another level to the soup which I really like. I think everyone has their own version of a chicken soup. Some are lovingly passed down through families, some are created from scratch and some are pulled from cookery books. 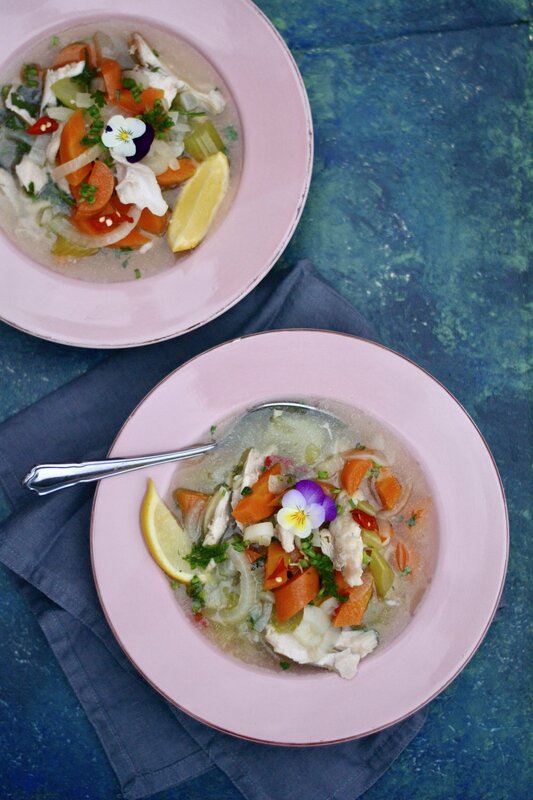 But just in case you don't have you own yet or are in search of a new one, here is my beloved chicken soup recipe which never fails to make me feel better. It's nursed me and my loved ones back to health on many occasion and I pass it to you like a recipe baton, hoping it brings you as much joy as it's brought to me. If you've never made you own chicken soup or never made your own stock, well all I can say is that you are in for a treat. The light, subtle broth brimming with goodness is a delight and so easy to make. I highly recommend getting into the habit of whipping up a stock whenever you roast a chicken as it's a magical elixir that's going to transform your cooking. Turn the stock into chicken soup or serve as a broth poured over rice. Or if you are really looking for something to change your cooking game, cook your pasta in the stock..you're welcome. Take a large heavy bottomed saucepan and add a little olive oil. Add the crushed garlic and the ginger and gently fry for a few minutes. Season well. Now add the chicken, the sliced celery, carrots and the onions. Add the bayleaf. Top with the water and bring to the boil. By this time the chicken thighs should be lovely and tender. Remove them with a slotted spoon and allow to cook a little before shredding the the meat and discarding the bones. Return the chicken to the broth. Scoop out the bay leaf, and stir in the chopped parsley before ladling into bowls. Serve with a wedge of lemon and a sprinkling of fresh red chilli if you like a bit of a kick.